When you're super rich, it must become increasingly difficult to find fun ways to spend your money. A yacht? Sure. Private island? Okay, of course. But why bother with all the cliché purchases when you could instead use your copious disposable funds to pay for something no one else has, like, say, a mountain with your face carved into it? That's what one dude has his sights set on, and he's hoping to find a mountain big enough to fit the visages of his entire family, Mount Rushmore-style. 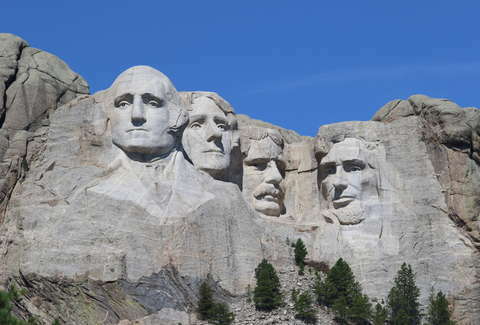 Like a real-world version of Richie Rich's "Mount Richmore," one wealthy English businessman has set his sights on purchasing a peak in Scotland big enough to carve the faces of himself, his wife, three sons, one daughter, and family dog into, according to The Herald Scotland. And you thought your laser-background department store family portraits were epic. The man, who has not been identified, has apparently placed a request with the luxury shopping site HushHush.com to help him locate a mountainside for sale that's large enough to feature his family's faces, and he's reportedly willing to pay up to $15.5 million for it, which frankly seems like a bargain for a whole mountain. Scotland is likely the best location to find such a place, on account of its many high peaks according to a spokesperson for HushHush, per the Herald. Private buyers have purchased mountains in Scotland before, including one peak known as "the anvil," which fetched about $2.2 million back in 2000. While this grandiose plan to put Mount Rushmore to shame is for sure over-the-top, it is not without its critics. Notably, conservationists in Scotland are very much opposed to turning any bit of the country's natural beauty into an ego-driven monument. "We hope no one would dream of selling any mountain so it can be defaced by an irresponsible millionaire," said a spokesperson for the John Muir Trust, which owns the upper slopes of the country's highest peak, in an interview with the Herald. "We would suggest that the anonymous would-be vandal has their head in clouds if they imagine that they can write a £12M check in return for the right to turn one of Scotland’s world-famous mountains into a monument to wealth and ego." Others are convinced it'll never happen because many of the highest peaks are protected and no conservation organization would ever approve of such an act, while some are simply dismissing the whole thing as an elaborate hoax. However, HushHush insists the inquiry is legit, and that this same person is also on the hunt for stone carvers who might be up for the job. He's also hoping to remain anonymous through the whole process, because he wants the finished product to be a surprise for the family. Multi-millionaires, they're just like us!